We have been spoiled, I realise that now. Let me explain. Our dishwasher isn't working. It took me a few days to realise that the reason the dishes were coming out greasy was that the water wasn't heating up. What to do? Get it fixed or buy a new one? It is seven years old, after all and was in the house as an integrated appliance when we moved in. £400 for a new one or equivalent spec or £163 to get it fixed including a 12 month support contract. I went with the latter, strangely enough. After all, the contract with the repairers says if they can't fix it, they'll replace it new for old, so I can't lose. But they're not coming to fix it until Tuesday so I have been having to WASH UP BY HAND! I know, for many people, this is what they do every day, but when you're used to just bunging plates into the dishwasher it has been a rude awakening. 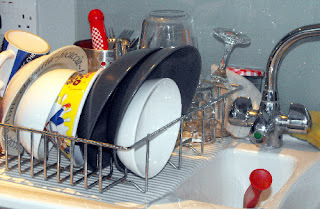 It's so time consuming, and you have to do it after every meal or you run out of dishes or room to stack them on the drainer (no, I'm NOT drying them too). Technology has revolutionised our domestic existence in so many ways. There is no worse moment for me, appliance wise, than when the washing machine breaks down. There are three grubby males in this house who produce copious amounts of dirty clothes. And yet, my grandmother's generation managed without washers and dryers. Took them all day though, but then looking after house and family was their main job - and no-one lambasted them for it. Mind you, working mothers get it in the neck too, so you're damned if you do and damned if you don't. I am lucky that I can work from home and have the best of both worlds, but that is only because of technology and the internet. We had a power cut the other week. I was unable to get online! Imagine! Much of my work relies on the internet but with the power out, I felt strangely free. I read a magazine. It was Mslexia, a women's writing periodical so I still felt it was work-related, but still. I worried about the fridge-freezer though, if the power didn't come back on. There was the dog's frozen minced tripe in there and it stinks at room temperature. It's not that pleasant when it's frozen either. The children moped about. No Xbox. No Minecraft. No Electric guitar (mercifully) though of course, the acoustic still worked. Oh, boys, look at this, it's called a book. You don't need to plug it in! In memory of Sonia, my friend. How do your children see you? Trying out "The key to the fountain of youth"